You do not need me to tell you that we have a very strong ridge of high pressure setup right off the coast of California and it is bringing us very warm and sunny weather ... for now. We are starting to see signs of another wet pattern forming and effecting the Tahoe area starting about a week from today (3/20). The storm track is from the south and everything is going right around our ridge of high pressure. 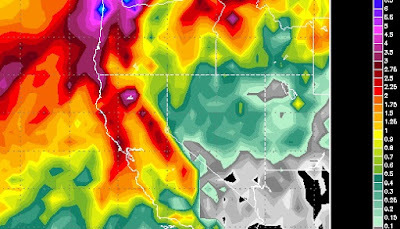 However, as that breaks down that storm track is going to go straight through Tahoe. These storms should continue to hit our area for 3-5 days (maybe more, too far out to call). However, I see some shadowing, which is often the case this time of year, so the Carson Range will not be getting as much moisture as the other side of the Lake. You can see the shadowing going on. Having said all of that, in a few days we will get a better idea of these storms. 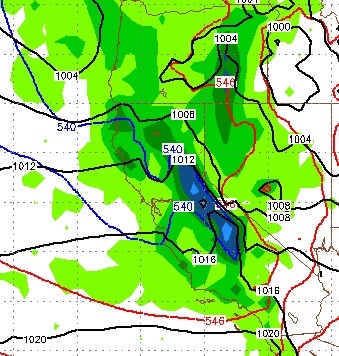 There is an adequate moisture tap and they should be coming in cold with snow levels around 7,000 feet. So let's give the models a little time to digest this.